Engineered to deliver flawless results on even the most sensitive paints in less time. Our best finishing, highest gloss polish - ever! Definitely want to try s​ome of that!!!!!! Even better finish than M205 ? I want it now. I always admire the depth of paint created by M205, Looking forward to add M210 to my arsenal. I am the paint whisperer. How have you been, Sir ? Have you tried M210 with microfiber pads (KBM) ? I have not tried 210 with microfiber pads yet, but I can tell you, it for sure is not going to cut as much as M205 can. I have a fair amount of hours with 210 under my belt personally, and I am very excited to have it in our line up. 205 is a great polish but it struggled to finish out D/A Haze & tick/micro mar free on certain paints, especially sensitive darker colored paints. We would then result to having to use very strict amount of passes, pressure, pad, amount of product in pad, speed, size of working area, etc. to get it to finish down with no haze on those sensitive paints. With this new 210 Ultra Pro Finishing Polish, you can pretty much throw some on a pad, barely even try, and it works great, it's awesome! In most cases when I have tested/used 210, I have been using it as a follow up to a compound. I have used it in one situation to remove light/moderate swirls & fine scratches on our company tahoe, which I have worked on many of times, and pretty much anything will haze it. We worked the 210 pretty aggressively on our MT300, with our DFP5 yellow foam polishing disc, and I was quite surprised how much it cut, and the finish was perfectly haze free & full of gloss. Mike Stoops was detailing some sort of red Ferrari a few weeks back, which he has detailed a few times prior, and he said that he gave 205 Ultra Finishing Polish a fair run, & it was struggling to finish D/A Haze free. It again required very strict control of all variables, pad, pressure, amount of product in pad etc. He then explained that it he threw some 210 on a yellow polishing pad, barely even tried, and it came out perfect. This sounds like you guys have hit the ball out of the park again, as you did with 105/205. Really was an inflection point for the industry. Thanks for the detailed description, Nick. It looks like M210 cuts slightly less than M205 but it finishes better and worry-free on all types of paint. Sounds like a dream come true! 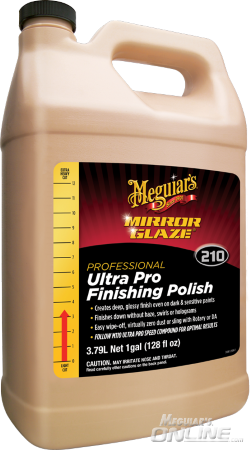 I'm glad that Meguiar's is offering solutions for the dusting issue in the universal compound, and finishing in the premium polish. Those were the only problems I've ever encountered with my M100/M205 set up. I will happily give this new duo a try, and I imagine they will become a permanent staple in my arsenal. *NEW* Meguiar's M205 Ultra Finishing Polish Review!!! !